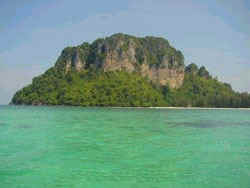 100 m high hills rising from the water, is regarded as the symbol of Krabi. It sits before the city and can be visited by long tail boat from Chao Fa Pier. Travel time is about 15 minutes. From the boat, one climbs a staircase to see caves with stalactites and stalagmites. Many human skeletons have been found in the area. It is theorized they are the remains of immigrants who became stranded and died after a sudden flood. 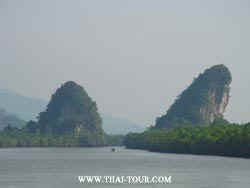 Tham Sue or "Tiger Cave"
is located about 3 kms from Krabi Town. Inside the cave there are what appear to be tiger paw prints in the stone. The surrounding area is covered with large trees hundreds of years old, particularly in the Khiriwong Valley. Mountains are on all sides and there are smaller caves in great number. Aside from being the site of a meditation center, it is also a place of archaeological and historical interest. Stone tools, pottery remains, and the mold for making Buddha footprints have been found in excavations. is located at Ban Nong Kok, Tambon Sai Thai, 7 kms from the town on Highway No.4034. It is a beautiful cave with stalactites and stalagmites. In 1909 the future King Rama VI visited the cave here, earning it the title "Sadet" indicating the presence of royalty. composed of eight small natural swamps in a vast valley of Tambon Khao Thong. This forms part of a park which is being turned into recreational area. Sa Kaeo is accessible by the Krabi-Nai Sa route (Highway No.4034), a distance of 28 kms. About 18 kms from Krabi town along Nai Muang-Nai Sa Road, is a scenic beach lined with casuarina trees which extend for several kilometres. A rocky island, about 1 km from the mainland, can be reached by foot at low tide. Minibuses leave the town to the beach daily from 6.00-17.00 hrs. Accommodation at the beach is available. Reservations should be made in advance at the Forestry Department, Tel. 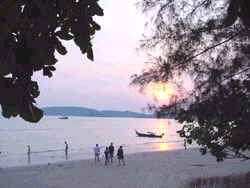 5790529, 5794842.
is located at Ban Laem Pho, 17 kms from downtown Krabi along the route to Hat Noppharat Thara. Long ago this was a freshwater marsh populated by clams and other bi-valves, chiefly little two centimeters long "Hoi Khom" or pond snails, which grouped and multiplied in such numbers that the dead formed a floor for the living. This process, repeated over eons, led to the creation of layer of fossils about 40 cms thick, called shelly limestone. Scientific test have established that the age of these fossils is about 40 million years. Minibuses leave the town for the Fossil Shell Beach daily from 6.00-17.00 hrs. 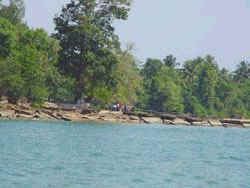 is situated 6 kms south of Hat Noppharat Thara next to a road that runs parallel to the coastline. A scenic bay, its white sandy beach stretches to the foot of a conspicuously prominent limestone range. Accommodation is available along the the beachfront. Other facilties include diving shops, boats for rent a sight-seeing by canoe. From Ao Nang bay, tourists may hire boats to visit nearby attractions such as Hat Rai Le, Tham Phra Nang, Sa Phranang located on land to the east of Ao Nang, as well as other off-shore isles of Poda, Tap and Mo.